All restaurants aren't the same. 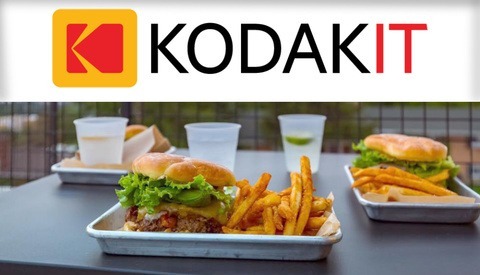 They will serve different dishes, have different interiors, and charge different amounts for what they serve. When you are assigned to shoot a restaurant's signature dish, you will find that all restaurants will have one thing in common. There will be a table for guests to dine at, and for you to shoot at. Do you think of a table as just a table? Before you brush off the importance of selecting the right shooting surface, let me show you a few examples of how this decision will impact your image. When arriving at a restaurant, the first thing that I do is figure out where the best light and tables are. Restaurant tables will come in a wide variety of shapes, sizes, colors, and materials. Some will be a dark stained wood while others might have a vibrant color or design on them. They can be made out of a polished stone or could be covered with a crisp white table cloth. Whatever they are made of, their design will complement the restaurant and are an important part of your image. Here are few table top situations that you may find yourself working in. Solid tablecloths or stone-like materials are very common in fine dining restaurants. These restaurants will often have a higher price point to their dishes and have a more elaborate presentation. 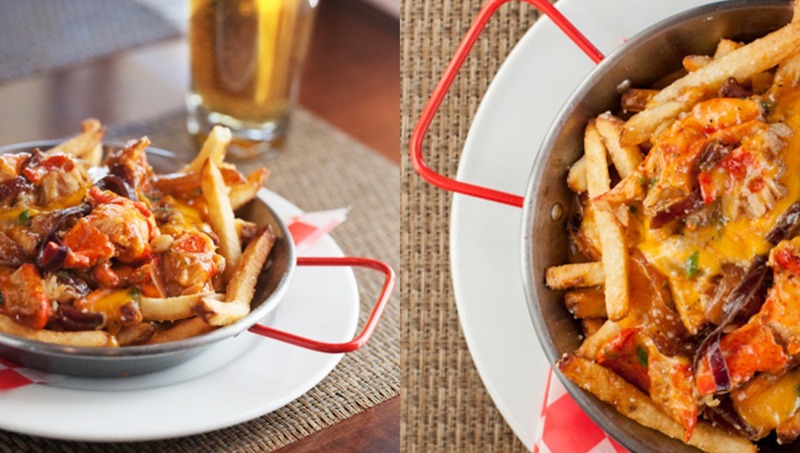 These surfaces are great to shoot on, because they don't distract from the main dish. In these situations, I like to place my light source behind the food and shoot with backlighting. Many wooden and marble tabletops have a glossy finish to them. This creates a very reflective surface that can cause some distractions. If you are using daylight from a nearby window, you may have to adjust your camera angle and cropping to avoid capturing a set of distracting reflections. Above is an example of a salad shot on a granite table top. On the left you can see the salad from a head on shooting position. Can you see the plate reflecting off the table? Some Art Directors or Photo Editors may find this reflection distracting. To avoid it, you can zoom or move your camera closer. The other option is to shoot from an overhead angle like you see in the image on the right. If you are using an artificial light source, you will experience a different problem with reflective table tops. Look at images A and B. Can you see how image B has a bright highlight on the table, while image A doesn't? 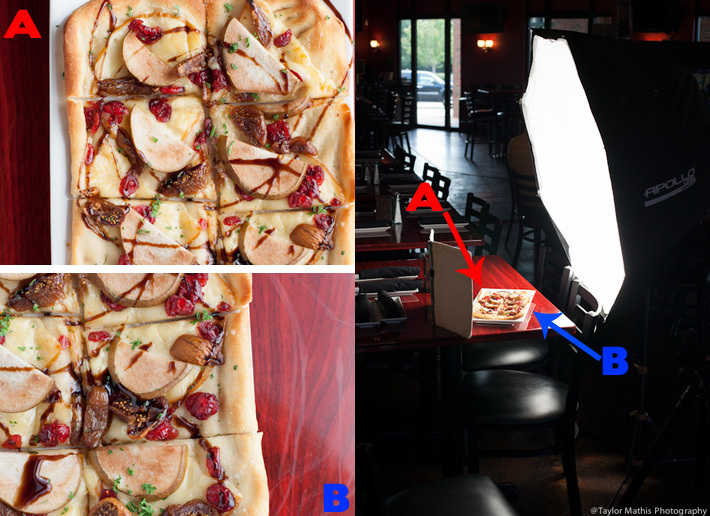 If you look at the lighting set-up, you can see that the light source is on the right side of the flatbread. The light source is creating a large white highlight on the reflective table top. On the opposite side of the flatbread, there isn't a white highlight. By moving the dish over towards the left, I was able to capture an image of the table without the distracting highlight. 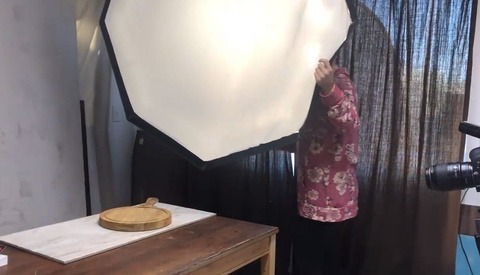 If you are having a problem with your table reflecting your light source, move the dish around so that it is still lit, but the reflective table isn't in the image. Many restaurants will have uniform tables throughout the dining room. In this case, I choose the table with the best lighting environment around it. If your restaurant has a variety of table surfaces try shooting on different ones! 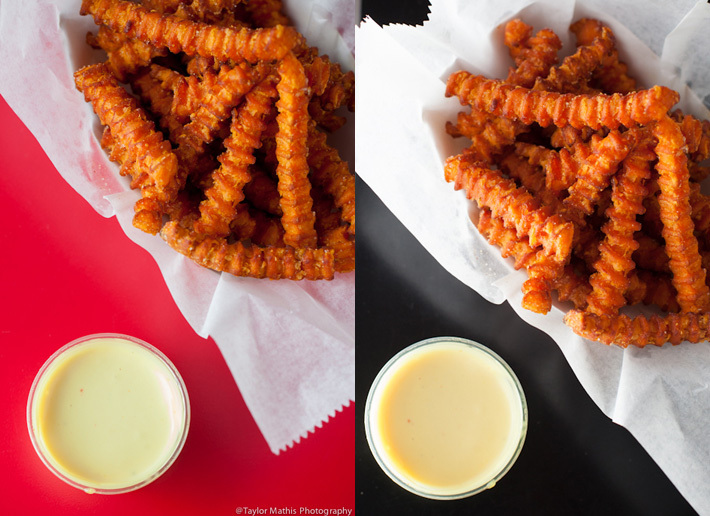 Above is a shot of sweet potato fries on two very different backgrounds. You never know which your client may like better, so when in doubt, I always take a picture using both! When shooting overhead, any flat surface can become the background for a dish. If you find that the table itself is rather generic, but the placemat is interesting, take a picture with the placemat! The image on the left shows the placemat on the table. By changing the camera angles, I am able to create an image with just the placemat as the background. Variety like this is especially nice when you are shooting a story with multiple restaurants featured. Often, you will see the same dark wood or solid color table surface at different restaurants. Throwing in an option with a placemat background will add some variety to the collection of images! 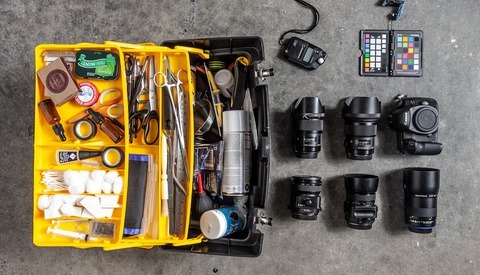 I hope these tips help in your future restaurant photography! 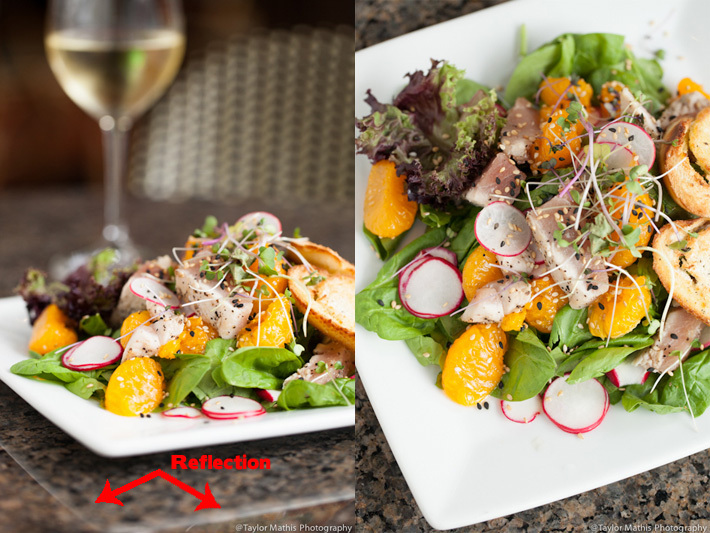 For more tips and tutorials on food photography, check out Issues 1-8 of photographing FOOD! Nice article with lots of common sense solutions. Thanks! I do quite a lot of food photography and I now have a selection of surfaces (old pieces of wood, slate, metals etc) that I take to shoots. I also have a pile of dishes and cutlery etc that will give me a choice of colours and textures. If you limit yourself to the restaurants tables and plates you can find the images regardless of the quality of the food are dull. Also you need to try and capture fresh ingredients, spices, herbs so worth getting the restaurant to get these in on the day of the shoot rather than 3 days earlier where they will look a bit tired. this is no food photografie, it's an painting! Amazing pictures! I love it!